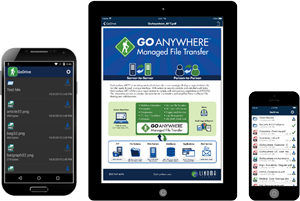 Linoma Software [now HelpSystems] announces the release of mobile apps for GoDrive by GoAnywhere, its secure on-premises document storage solution that offers users Enterprise File Sync and Sharing (EFSS) capabilities. Authorized users can now synchronize and share documents, photos, videos, and files across Windows and Mac devices, iPhones, iPads, and Android phones and tablets. GoDrive users have access to files directly from those devices, as well as optionally download files for offline access. The mobile app automatically updates files and folders to the most current version each time a registered mobile device connects to the server. Designed as an alternative to cloud-based file-sharing services, GoDrive features localized control with on-site file storage to meet compliance requirements and detailed audit trails for ease of management. Files synchronized to GoDrive devices are secured end-to-end using AES 256-bit encryption and dual-factor PIN authorization during device registration ensures complete security for sensitive data. GoDrive provides advanced collaboration features such as file and folder sharing, file-revision tracking, and commenting. Included with each installation of GoAnywhere MFT, Linoma's secure file-transfer solution, are ten free GoDrive user accounts. The browser-based interface helps administrators manage users, security settings, and shared folders. Administrators can also set disk quotas at the system and user level, view disk usage and file histories, and deactivate and eliminate GoDrive folders from lost or stolen end-user devices. Clustering is also available, providing scalability to support an unlimited number of GoDrive users and files. For active-active networks in which each node has access to replicated databases and server applications, clustering maximizes availability for mission-critical file sharing. More details on GoDrive by GoAnywhere are available here. PREVIOUS Are You Ready for GoAnywhere MFT 5.1?